Helping children and adoptive parents become a family is a truly rewarding experience. We strive to make the adoption process as smooth as possible and let parents focus on what really counts, loving their new child. Note: All of the children on this page have found their forever families. None of these children are available for adoption. I'm blessed beyond words with Sydney and Max and thank God everyday for choosing me!! I can't help but look at them and smile. My heart runneth over!!! Max melts your heart with his precious smile and Sydney is the best big sis with her precocious ways. Her mind is always working in overdrive!! Thank you, thank you, thank you Adoption Covenant for helping me be a mommy. It's the best! In March 2010, we decided to adopt a child. We were blessed to find Adoption Covenant and found 'small world' connections that further drew us to them. We were quickly matched with our birth mother. Everyone involved felt it was a 'God thing' and meant to be, so we officially "matched." We were thrilled to be involved with doctors appointments and will never forget the first time we heard our sons heart beat. Goosebumps to this day. We were able to be in the hospital the night he was born and saw him minutes, really seconds, after he was delivered. Since that time how our life has changed. We have the most precious, handsome baby boy. He has just had his first birthday. We had pretty much given up the idea of a child in our home but Adoption Covenant and our birth mother changed that and neither of us could imagine life without our son now. The joy we feel each morning seeing his face as he wakes up, or when we hear MaMa or DaDa. Again goosebumps. We are incredibly blessed to be a family and owe that to Adoption Covenant, our birth mother and God, who gave us the most wonderful gift we could ever imagine. We feel sincerely touched daily. "I am and will always be forever grateful to Adoption Covenant for being there for me and for finding the perfect place for Ford. Everytime I see a little kid with not so good parents or being neglected or hungry or dirty or anything other than totally happy and healthy, I think of Ford, Mike and Kathryn and how I know in my soul that Ford will never have to experience the bad stuff those other kids have to. He will have an outstanding life. Sooo, just wanna say THANK YOU again. You ladies do more than match people together, you alter peoples lives for the better, and that is a wonderful thing! =) Birth Mother--Cauline"
Over this past holiday season, all I could think about is the courageous, generous person who decided that having us raise her daughter would make the best life for them both. With that one, selfless decision, she completed our family. Our adoption journey began back in December of 2010 when we attended an information meeting at a local agency. After learning we were not able to have biological children of our own, we breezed through the home study process in anticipation that a child of our own was finally in our sights. After being presented several situations but never one that felt "just right", in February of 2012 we signed up with Adoption Covenant. Two weeks later we got a call saying that a birthmother had seen our profile and wanted to speak with us on the phone. We were elated. After learning more about the birthmother's situation, we couldn't help but get excited about the possibility of finally being matched. We began to prepare for the most important meeting of our lives. Because of the distance between us, we scheduled a conference call for two days later. We didn't know what exactly to expect since we had never made it to this point before. We were immediately put at ease the moment we started speaking to Mama B, the birthmother. We were in awe of her bravery, maturity, and intelligence a she led the conversation and asked us questions about ourselves, our family, and our life. We asked her some questions about how she was feeling and what types of things she liked to do. The more and more we spoke, the more we had in common. After we hung up, the social worker called us back almost immediately and said that we officially had a match. She explained that the birthmother had felt such a deep connection with us. The birthmother loved that we enjoyed spending time outdoors and traveling, much like her. She also felt a connection with my husband because he is a volunteer firefighter. She explained to the social worker that she has a deep history of firefighters in her family. She even had noticed in our profile that our nursery was painted her favorite color. Over the next several months, I continued to text Mama B. Our connection grew deeper as she shared with us ultrasound pictures, updates on doctor's appointments, and pictures of her growing belly. My husband and I still stayed somewhat guarded knowing that she could change her mind at any point, but the excitement and anticipation fo our dreams finally coming true outweighed the uncertainties of the situation. When the time finally arrived for our baby girl to be born in June 2012, we made the trip to Texas and finally got to meet Mama B in person. It was surreal but we felt like we had known each other for years. Mama B brought us some family heirlooms to give to our baby girl when she was older. She shared with us pictures and stories of family history. We clung on to her every word as we knew this was part of our baby's history and always would be. The next day we met at the hospital for our baby to be born. Mama B allowed me to be in the room during delivery and even let me cut the umbilical cord. Her actions only prove how comfortable she was with her decision. Despite her unfortunate situation, she was thrilled to see how happy and excited we were to become parents. At the hospital, the goodbye was the most difficult part. The future of our relationship with the woman we had grown to love and respect so much, the woman who had given us the most precious gift, the woman who had made the one most important decision of her life which completely changed the course of ours, was so uncertain. As we said our goodbyes, all I could think about was how thankful I was that I have all of these memories, interactions, and pictures to share with my daughter someday. I'll be able to wholeheartedly tell her about how much Mama B loved her, cared for her, and truly wanted what was best for her in life. Mama B will always be part of our family and we continue some communication to this day. While it may be less and less frequent, that doesn't mean I don't see her in the face of my daughter and think about her all the time. The day we met, we gained not only one family member, but two. The holidays would not have been complete without our precious daughter. We are eternally thankful to the woman who has completed our family and made all of our dreams come true. My husband and I have always had a heart for adoption from the moment we held our first child in our arms. We were able to have two biological children, but it was not without enduring the pain and struggles of miscarriages. The thought of any child living in this world without a family that loves them is hard to fathom. We were looking for a local adoption agency that we could trust and feel at ease to approach with questions and concerns. Adoption Covenant met and exceeded our expectations. We were able to feel a personal connection with Merinda and her staff. She has gone through the adoption process herself - she has lived it. She knows firsthand the frustrations of waiting and the joy of finally being united with your adopted child! Our experience in Russia was wonderful, things went smoothly. From our first meeting to the court date to bringing our sweet new baby girl home! Thanks to all of the hard work and attention to detail that was given by Adoption Covenant. Our daughter has brought such amazing joy to our family! She is fun, loving and full of smiles - our two boys adore their new baby sister and Mom and Dad are pretty smitten with her too. 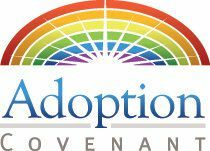 We are very thankful to Adoption Covenant for bringing our dream of adoption to fruition. “It must be your greatest joy to see such happiness in others as a child and family find each other. You are such special people to dedicate yourself so much to your work and invest so much emotionally and physically in making everything come together. You have changed our lives! There are no words to adequately thank you for the joy you've given us.